What price for perfection in a super-fast telephoto camera lens? 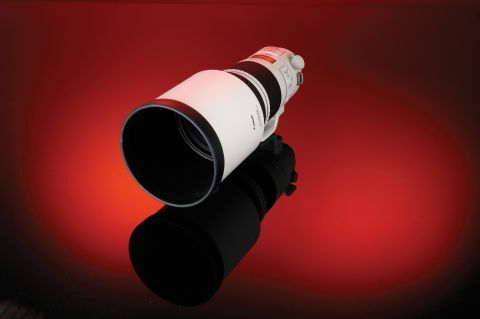 The Canon EF 300mm f/2.8L IS II USM is one of the latest telephoto and super-telephoto lenses to hit the market, or perhaps we should say to clobber it, given the size and weight of the 300mm and its even bigger 400mm brother. A fully professional telephoto lens, aimed predominantly at sports and wildlife photographers, the Mark II edition of the EF 300 f/2.8L is certainly no lightweight, at 2.4kg. That's despite an all-new magnesium alloy body with titanium components that shave 8% off the weight of its predecessor. It measures 128mm in diameter and is 248mm long, extending to 374mm with the lens hood fitted. As one of Canon's top-notch professional lenses, the EF 300mm f/2.8L IS II USM has just about every feature you could wish for. Ring-type USM autofocus is of the highest standard, and comes complete with Power Focus mode and a Focus Preset facility. Select Power Focus from the three-position AF/PF/MF switch and a separate focus ring, called the Playback ring, enables dual speed motorised focus adjustments – ideal for video shooting. The Focus Preset button enables you to store a focus position in memory, then return to it at any time by pressing the button again. As well as on/off positions, there's an additional 'on' setting that gives you a confirmation beep. A three-position focus limit switch enables you to select the full focus range or limit it to 2-6m, or 6m to infinity. There are also four AF Stop buttons around the lens' circumference, forward of the focus and Playback rings, which are useful for locking focus in AI Servo mode. The Image Stabiliser (IS) is updated in the Mark II lens to give a 4-stop benefit, compared with its predecessor's 2-stop stabiliser. It also comes with three separate modes. Mode 1 is for regular shooting, Mode 2 is for panning in either landscape or portrait orientation shooting, and Mode 3 only applies stabilisation during actual exposures, which works well when you're trying to track erratically moving objects. Other features include a drop-in 52mm filter holder at the rear of the lens, strap mounts, a carrying strap and a rotating tripod mount. The tripod mount's locking knob also includes a Kensington lock facility for securing the lens, like those often fitted to laptop computers.